Mount Goethe is the highpoint of the Glacier Divide, an east-west offshoot from the main Sierra crest that forms the jagged northern boundary of Kings Canyon National Park. The Glacier Divide separates the desolate Humphreys Basin from the lush Evolution Valley. As with the other major (and mostly unnamed) peaks of the Glacier Divide, the north side of Mount Goethe drops precipitously down to its glacier and thus commands an outstanding view of the Humphreys Basin and surrounding mountains. The NE ridge and the SE slopes are the two most common routes used to get to the summit. Secor doesn't give much info on the north side of the peak, saying only that the north face has "a Class 5 route". Another possibly interesting route on the north side would ascend one of the steep snow couloirs leading from the Goethe Glacier to the west ridge and from there to the summit. I considered this on a May 2004 trip but decided otherwise when I saw the monster cornice guarding the exit. Mount Goethe is at the north end of the Evolution Region. It can be accessed from the east via the trailheads above Bishop, and from the west out of Florence Lake. The most direct access is via the Paiute Pass trail out of North Lake (west of Bishop). From the top of Paiute Pass, Mount Goethe is the massive peak that lays slightly to the southwest. Another option is to bag Mount Goethe as part of a loop trip in the Evolution Region – hike over Pauite Pass and Alpine Col (just east of Mount Goethe) to access the Evolution peaks, and then exit via Lamarck Col or Echo Col. As always in the Sierra, the approach from the west is longer but involves hiking up through some great meadows and forestlands along the South Fork of the San Joaquin. To get to the North Lake (Paiute Pass) trailhead from US 395, turn west in Bishop on Line St. (CA 168 west) and drive about 15 miles. Just past Aspendell, take the signed turnoff to North Lake. This is a very narrow part-dirt, part-paved road, and will likely be closed prior to late April. The western approach from Florence Lake is reached via CA 168 east out of Fresno. Drive to the end of the increasingly narrow road (over Kaiser Pass). There is a boat ferry across Florence Lake that will shave four miles off your hike. For hikes originating on the east side, wilderness permits are required for overnight stays, and can be obtained from the Inyo NF. West side backpackers should obtain their wilderness permits from the Sierra NF. Ideally, right after the North Lake road opens in the spring, if you don’t mind snow travel. Otherwise, climb it in the summer or fall. Camping on the north side of Mount Goethe can be a challenge due to the lack of any available flat space amidst the piles of talus. There is one spot at the south end of Goethe Lake, at the base of the slope leading up to Alpine Col that can accommodate tents. 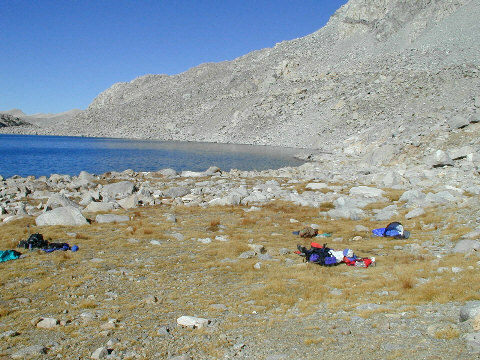 Other than that, you’ll likely have to camp below the lakes or further down in Humphreys Basin. Camping on the south side of Mount Goethe is very pleasant around Darwin Bench, which has stunning views out over Evolution Valley to the Hermit, Mt. McGee and the Goddard Divide. Contact the Inyo NF. Or call some of the local Bishop guiding services.